Click here for my latest news. See the tabs above to navigate and the links below for more. Email me at dfern@ndez.me with any and all questions, comments, or just to say "hi". I'm Daniel Fernández, a field roboticist and engineer living in the Pacific Northwest. I'm working for PolySync, a Portland-based startup seeking to be the "Operating System" for Autonomous Cars. You can see more by visiting their website or clicking the Autonomous Cars tab above. Before that, I earned an M.S. degree in Robotics at Oregon State University under Dr. Geoffrey Hollinger. You can check out some of the Research we did at the OSU Robotic Decision Making Laboratory by hitting the Marine Robotics tab above. Feel free to also peruse my CV and work history under the Experience tab. You may also be interested in reading more in my About Me section. You can also use the links to the right to get to my accounts on GitHub, Twitter, Instagram, LinkedIn, AngelList, and Google+. I'm happy to announce that PolySync has launched DriveKit, an out-of-the-box solution for by-wire control. I architected the full system for the 2014-2016 Kia Soul, including all hardware, and can comfortably say that this has been the most interesting and challenging project I have engineered. I am incredibly proud of the product; it is a safe and reliable system to enable driverless car control and accelerate research goals. DriveKit Support of Kia Niro Hybrid from PolySync on Vimeo. The OSCC firmware is used to control DriveKit and is available for download. I had the opportunity to volunteer in Puerto Rico for 3 weeks this year in relief of Hurricane Maria which struck on September 20th. I arrived on the 15th of October and found the country still reeling. 21 days, 9 roofs, 14 power lines, 63 tons of water, 1 school, and 3 zoo pens later, and NW Puerto Rico is getting back on her feet. I'm honored to have been able to work with such committed and generous people and I'm grateful for the chance to help those with considerably less good fortune than myself. Visit the RBC Maria Relief facebook page for more info on the organization I worked with and how you can help too. The Field Applications team along with myself headed down to Willows, California for the annual Self Racing Cars (SRC) event. This was part of a joint project between Udacity and PolySync. The team designed a simulator to test an end-to-end Neural Net driving application and collected training data at the Thunderhill raceway track using an OSCC-connected car. Methods applied included a Convolutional Neural Network, Recurrent Neural Network, and a PoseNet approach, yielding a total of 800 meters of uninterrupted autonomous driving. You can see more at the Medium link below. 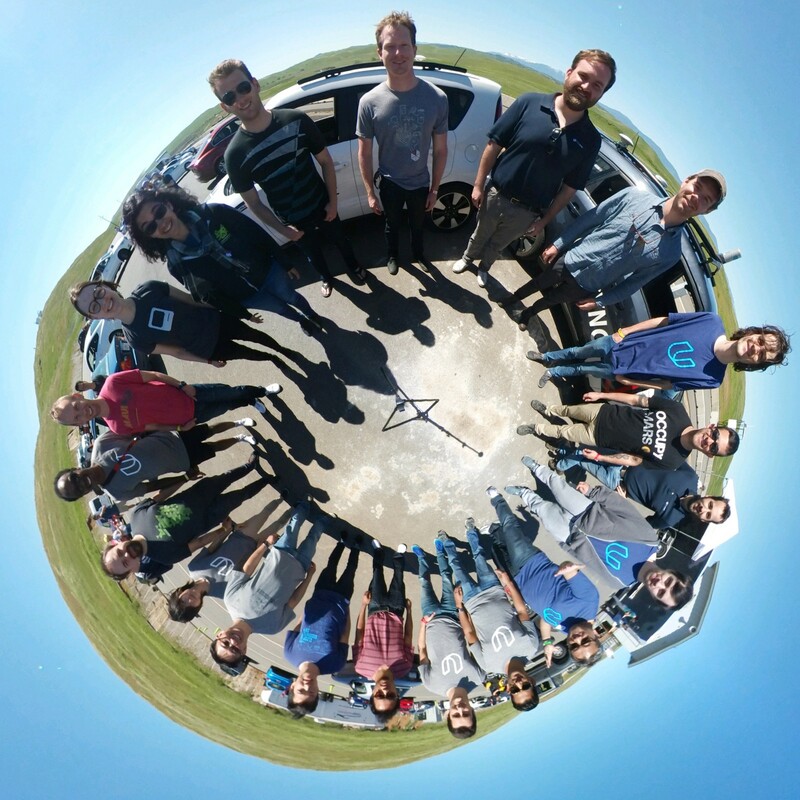 The Udacity + PolySync team in 360 degrees. One of the most rewarding projects I've gotten the privilege to work at during my time at PolySync is the Open-Source Car Control (OSCC) project to expedite autonomous vehicle development. The GitHub repo is available for download today. I had the honor of heading to ICRA this year to present my journal paper. The final edition was published in the January 2017 edition of RA Letters. Here's a download link for reference. I've been pretty busy in SB but was happy to get back to Florida for my sister Katherine's wedding in Key West. It was so much fun and over way too fast. Andy got some photos which you can see here. I headed back to Santa Barbara in California to work as an engineering contractor for my former employer while I search for my next big move. It's interesting coming back here after finishing grad school. On the one hand, their culture is easily ten years behind the mainstream. On the other, there are so many low-hanging fruits to grab. I will be working on similar projects as last time, but I'm looking at two pretty exciting ones. First, I'm going to be using C++/Qt4 to create several assembly calculators to aid assembly. Second, I'm going to explore using an automated pick and place machine to do some very precise motherboard assemblies. All of this without ~root access... Wish me luck. Some of my research that I presented in Portland this past week at the annual NNMREC meeting. Practice defense talks in front of a critical and engaged sample audience. Nat and I took a much deserved break from work and thesis to road trip from San Francisco to Portland. We were joined by friends Erik and Tina as we made our way through Yosemite, Sonoma, up the Highway 1, and then into the Willamette Valley. They went on to Seattle before heading home to Louisiana. It was a great trip, and Erik got some photos which you can see at this link. Several OSU Robotics Labs attended the International Conference on Robotics and Automation (ICRA) this year in Seattle. Though Marine Robotics was not heavily represented, there was a ton of great presented work to keep us entertained. Here's a video I shot of a spider robot. The sensors and leg motors work to keep the robot upright at all times. The RDML Marine Group deployed the vLBV300 at the NNMREC North Energy Test Site (NETS) to checkout the moorings. We weren't able to test out any algorithms, but we did collect some visual data for in-house processing. We also learned a lot of what to expect on an actual deployment. Thanks to Captain Cody, Hatfield Marine Group, and R/V Elakha crew. Toured the NASA Johnson Center and Houston Mission Control while on the job hunt. There was plenty to keep this fanboy entertained. Highlights include an entire Saturn V stage by stage, a shuttle cockpit, a tour of the ISS, and of course Mission Control. Click here for the photos. The RDML Marine Group headed to Hatfield last week for some sea survival training for our upcoming cruises. Thane Somers took some good shots. See them below. For photo names, hover over the image. The OSU Glider Research Group and I were at the Hatfield Marine Science Center in Newport last Saturday talking about one of their Webb Slocum Gliders. Take a look!! Steve Pearce from CEOAS with SG130 before deployment. The wayward SG157 and HSU's Roxanne Robertson in the background. A cross-discipline team of roboticists, oceanographers, and marine biologists won the annual Keck Foundation grant to outfit bioacoustic sensors on Slocums. We'll be optimizing the path-planning so that the gliders gain maximum amount of information per mission. In essence, I suppose it will "think like a fish"